Reading over the posts in this and other forums, it occurred to me that we need to develop a primer on herbs and spices. There are, apparently, folks who don’t understand what they are, or how to use them. I figure there are enough of us here who can make inputs, and develop this into a meaningful tool. So, I’ll start, and, hopefully, others will join in. Storage: The great enemies of spices and dried herbs are heat, light, and oxygen. They should be kept, therefore, in airtight containers, away from heat and light. The worst way to store them is on an open shelf over the stove. Inside a cool cabinet, on the other hand, prolongs their usefulness. The life of fresh herbs can be extended by standing them in a jar or glass of water, in the fridge. Freezing fresh herbs in water extends their flavor life, but quality suffers. General definition: Herbs and spices are plants and plant parts used to flavor other foods, rather than being used as food per se. In some cases this leads to shifting definitions, because the plant or plant part can be either, depending on use. When used merely to flavor other foods, for instance, onions, garlic, and shallots are herbs. But each of them is used as a vegetable as well. Herbs: Herbs are the soft parts of plants; the leaves and flowers, primarily, but sometimes the stems as well. Herbs are used either fresh or dried. Dried herbs are added to a dish anytime during the cooking process. Fresh herbs should be added only towards the end. Drying herbs can sometimes change their flavor profile. Basil is, perhaps, the best example of this. Fresh basil and dry basil taste so differently they may as well be different plants. And some herbs, when dry, lose all semblance of their flavor. Summer savory is one such. Spices: Spices are the hard parts of plants; the roots, stems, bark, and seeds. Spices are always used either dried or otherwise cured. Exception: Fresh chilies are generally classed as spices. Spices are added anytime during the cooking process, but most usually they are added earlier rather than later. For best results, only whole spices should be stocked in the kitchen, rather than preground ones. Left whole, spices retain their essential oils---and thus their flavor and potency---indefinitely (indeed, this is what made the spice trade possible to begin with). Once broken or ground, however, they lose those characteristics quickly. Preground herbs should be replaced annually, at a minimum, and many times more often than that. Many spices, especially those in seed form, increase their flavor if dry-roasted just before grinding. Herb & Spice blends: Many dishes call for the addition of blends. Herbes de Provence, Ras El Hanout, and Texas Barbecue Rub are examples of commonly used blends. Because of the delicate nature of ground herbs and spices, such mixtures should be made up in smaller quantities, in amounts you are likely to use up in a reasonable amount of time. If you make up more than a two or three month supply you are likely making too much at once. 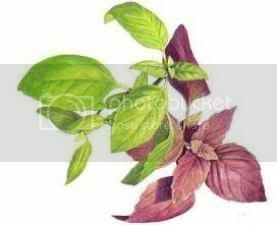 Basil´s Latin name is Ocimum Basilicum, and this herb is an annual with leafy stems that is native to India, Asia and Africa. People have cooked with Basil since 400 B.C. and it is the quintessential herb in Thai Cuisine, Mediterranean, especially Italian and Vietnamese Gastronomy. There are approximately 60 types of Basil. It grows extraordinarily well in full sun with lots of water, and is most flavourful before it flowers. Basil pairs best with the following foods: tomato and bufala di mozzarella, grilled vegetables, to flavor Italian olive oils, Genovese Pesto, pasta, pizza and chicken. Laurus Nobilis, called Bay Leaf or Laurel is an evergreen, indigenious to the Mediterranean and grows to the height of 20 feet. Fresh bay leaves are firm, shiny and somewhat bitter. On the other hand, dried Bay leaves have been used in cooking since the 1st century A.D. in the Mediterranean. Their flavour is assertive, and thus, usually one leaf per dish is sufficient. 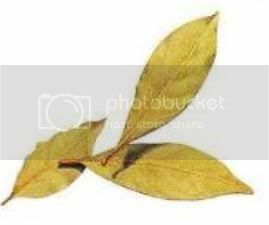 Bay leaves are often added to slow cooked roasts, meat stew dishes, poultry stove top dishes and roasts and soups A to Z, and is an essential ingredient in a bouquet garni. The leaves are normally removed before serving. 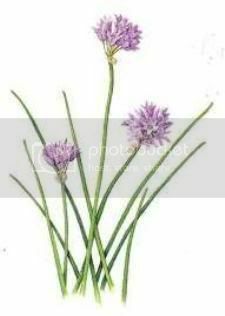 Chives, are the smallest members of the onion family and are native to the European Continent. Chives grow from seeds, or by dividing existing clumps. Perrenial in nature, they lookk like a thin, emerald green silk tube with purple blossoms. Chives are used whenever a delicate subtle onion flavor is desired. The blossoms make a spicy addition to omelettes, cream cheese, goat cheese or ricotta based dips and cheese spreads, baked potatoes with sour cream topping or potato salads, smoked salmon, smoked cod fish, smoked trout, smoked herrings and a variety of green mixed salads. To obtain, the most flavor, one should snip rather than cut the chives ribbons, as cutting releases the juices too quickly. When using chives, snip them close to the ground, and they shall continue growing all season. Chives are found throughout Europe, however, are more predominate in The Scandinavian countries and the British Isles, the central eastern countries and Baltic and northwestern Europe. Chives have been naturalized in the U.S. and Canada. 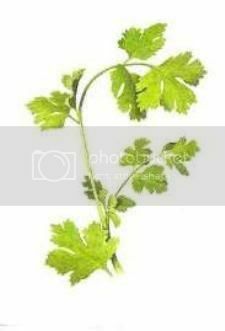 Coriander is an aromatic annual herb native to the Mediterranean. In most cuisines, "coriander" refers to both the foliage and seeds, but in North America the foliage is called "cilantro," and "coriander" is confined to the seeds. Its leaves, stems, seeds, and roots have been savored for over 3.000 years, and are quintessential in the following cuisines: North African, Mexican, Peruvian, Thai, Indian, Various South American and Caribbean countries, Middle Eastern and parts of China. This flowering herb, native to both Southern Russia and the Mediterranean, consists of bright green, delicate fronds, topped by yellow flowers which quickly turn to seed heads. It's an essential herg in several cuisines, including Russian, Scandinavian, Central European, Greek, and the western Mediterranean; and is an integral part of pickling. 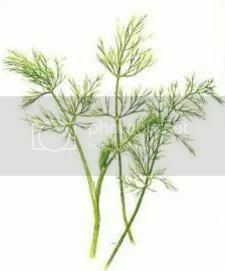 Dill herb is easy to grow, however, it is very delicate, and has a short shelf life, thus not holding for more than a couple of days in the refrigerator. Thus, dried dill and dill seed are used more often than fresh. Baked Beet root filled with feta cheese or ricotta, Eggs, Fish A to Z, homemade or jarred Mayonnaise, salad dressings, and potatoes (boiled, baked or as potato salad ). Dill is often used as a garnish. Spearmint : predominately used by the Moroccans in tea making rituals, and the gum and candy industries. Peppermint: greatly used in liquor production, confectionary and candy and cake making. Chocolate Mint Herb: mostly used in chocolate and candy making and liquor cordial making. For the most aromatic and flavorful mint, it is best to pick mint before its flowering stage. Mint is an important herb in the cuisines of Greece, Morocco, Turkey, Italy, Spain, France, India, the British Isles, Australia, and New Zealand. 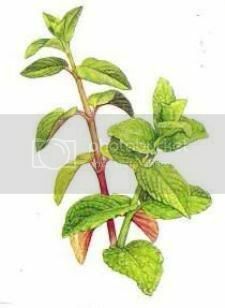 Dishes and uses of mint include: Roast Lamb with Mint Ali Oli or Mint Jelly ( countries with a large lamb culture ), Peppermint hard candies ( peppermint sticks and charms ), Icecream, Sorbet or sherbert. Green sweet peas, Potato Salad, Tea Punches, and Liquors. This aromatic perennial herb that flowers profusely in the summer, is an ancient Mediterranean must have culinary herb. 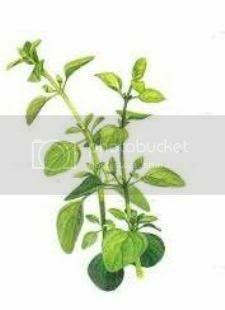 When you grow this herb, for the bushiest plants, snip the stems short at the beginning of the growing season. 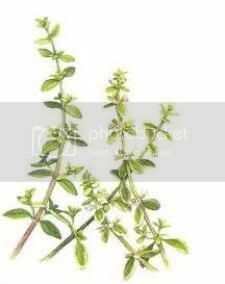 Oregano is commonly used in the following cuisines: Greek, Italian, Spanish, Argentinian, Mexican and Cuban. 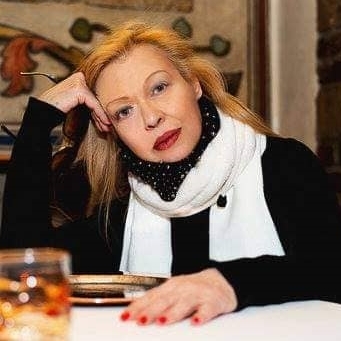 The dishes: It would hard to imagine a tomato sauce without oregano, Moussaka, slow cooked roasts, stove top stews, Italian baked pastas, Italian meat sauces and A to Z macaroni dishes and stews. Usage: use this herb sparingly, as it can be a bit bitter in excess. Fresh oregano is considerably milder than dried. In ancient time wreaths were used to ward off drunkenness—though proof of their efficacy in that capacity is scarce. Today, this slighs parsleytly peppery, fresh-flavored herb is more commonly used as a flavoring and garnish. Though there are more than 30 varieties of this herb, the most popular are curly-leaf parsley and the more strongly flavored Italian or flat-leaf parsley. Fresh curly leaf parsley is widely available year-round, whereas Italian parsley must sometimes be searched out in gourmet produce markets. Parsley is sold in bunches and should be chosen for its bright-green leaves that show no sign of wilting. Wash fresh parsley, shaking off excess moisture, and wrap first in paper towels, then in a plastic bag. Refrigerate for up to a week. 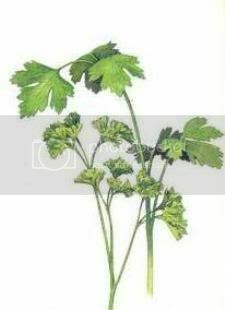 Dried parsley is available in the spice section of most supermarkets but bears little resemblance to the flavor of fresh. Parsley is an excellent source of vitamins A and C.
This native Mediterranean herb has been enjoyed for centuries for both its culinary and medicinal uses. The name comes from a derivative of the Latin salvus, meaning "safe," a reference to the herb's believed healing powers. The narrow oval gray-green leaves of this pungent herb are slightly bitter and have a musty mint taste and aroma. There's also a variety called pineapple sage, which has an intensely sweet pineapple scent. Small bunches of fresh sage are available year-round in many supermarkets. Choose sage by its fresh color and aroma. Refrigerate wrapped in a paper towel and sealed in a plastic bag for up to four days. Dried sage comes whole, rubbed (crumbled) and ground. It should be stored in a cool, dark place for no more than six months. Sage is commonly used in dishes containing pork, cheese and beans, and in poultry and game stuffings. Sausage makers also frequently use it to flavor their products. Firstly, the word Tarragon is linked to the French word, Herbe au Dragon, signifying Little Dragon. This linguistic connection has been derived from the serpentine shape of this herb´s roots. Furthemore, this herb originally hails from China and Russia, and travelled the trade routes in the 13th century carried by the Mongolians. 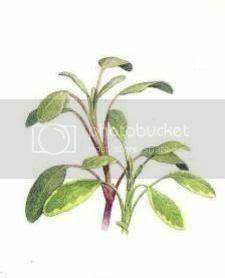 Dating back, it was also used by the Romans who had brought it to England centuries ago however, the cultivating of Tarragon in England, had only begun in 1548. Tarragon aromatic herb can grow to a height of approximately two feet. Unlike most herbs, it grows best in partial shade. It had been said, that tarragon has the power to heal liver and heart problems and was utilised by the Chinese, Mongolians, Greeks and Romans. For the most flavorful tarragon, do utilize the fresh. Vanilla bean. Vanilla beans are the cured pods of the vanilla orchid. Originating in Mexico and Central America, the orchid was transplanted to many parts of the world. Vanilla now comes from Mexico, eastern Africa, Tahiti, and certain islands of the Indian Ocean. The best vanilla beans, called “Bourbon,” are said to come from Madagascar and Reunion. According to the folks at Armedeus (http://www.amadeusvanillabeans.com) vanilla beans should be stored in a closed, but not air-tight, container, in a cool, dry, relatively dark place. Do not store vanilla beans in the refrigerator or freezer! (The cold will dry them out and may promote a particular type of vanilla mold.) The important thing is that the temperature be relatively constant and that air circulate a bit (unless they are vacuum packed, in which case you can keep them that way until use). If you do store them in an air tight, sealed container, we recommend opening it every couple of weeks or so to let the air circulate a bit. Stored properly, gourmet beans should remain moist and easy to work with for at least a year, many times quite a bit longer. If the beans do dry out a bit, you can place a half of a small potato in a jar with them to soften them for use. You can also soften them a bit by placing them in some warm water or milk just before use. Used primarily in sweets and confections, vanilla is also available in the form of extracts, pastes, and powders. What a great post and surely useful ..